It seems oddly inappropriate with this freakish snowstorm that we're currently having to be talking about showing some skin - and tanned skin at that. But, seeing as spring still feels an eternity away, I think we all deserve a little self-care and self-love in the form of glowy golden skin, even if you're the only one who sees it. A tan cheers me up. It makes me feel a little more confident. It puts a spring in my step. After being stuck indoors with a brand new little human for the past 3 months, I am so READY for spring and summer adventures. but until then, I can shop online and apply gradual tan to my heart's content. I've been using two products for this, one for face and one for body. They're equally fantastic and work a treat at turning my vitamin D lacking pallor into something a little more healthy. 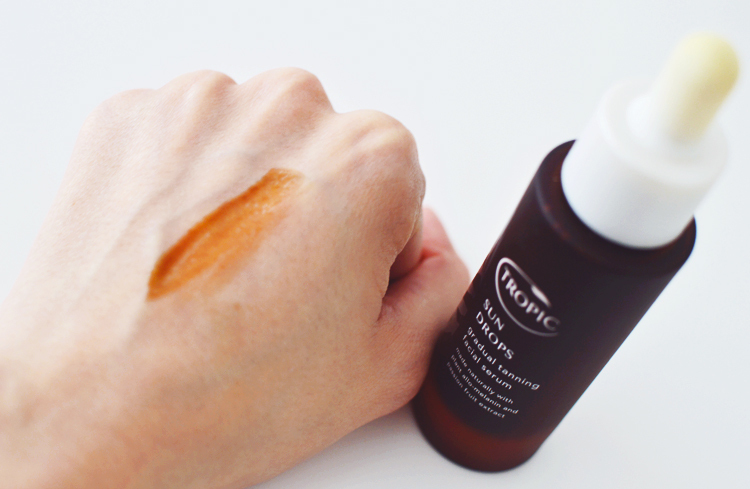 The Tropic Sun Drops Gradual Tanning Facial Serum is a booster serum that you add to your regular daily moisturiser to instantly give a little warmth and glow whilst gradually tanning the skin over several days. 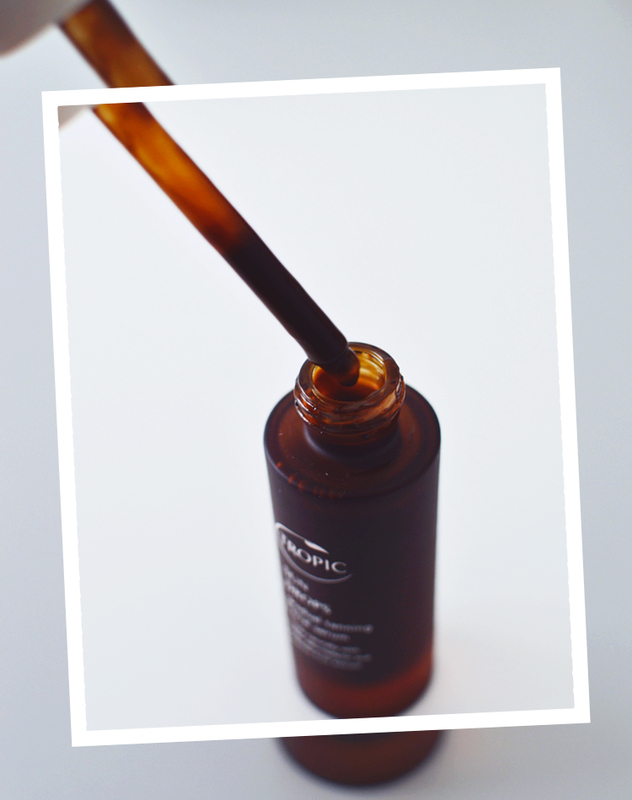 The serum is incredibly intense and a little scary at first glance, but don't be afraid like I was! 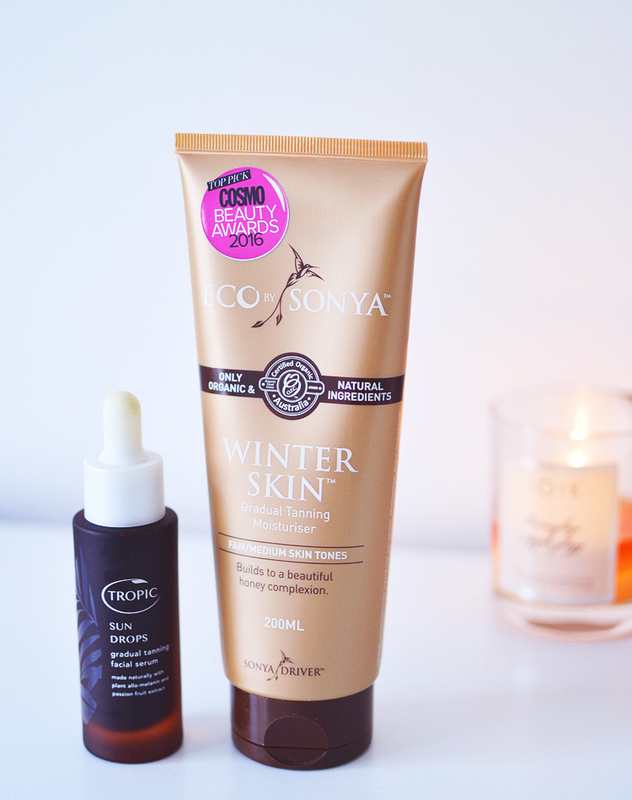 It dilutes right into your everyday moisturiser and application is as easy as pie. Suitable for tanning pros and first-timers alike. 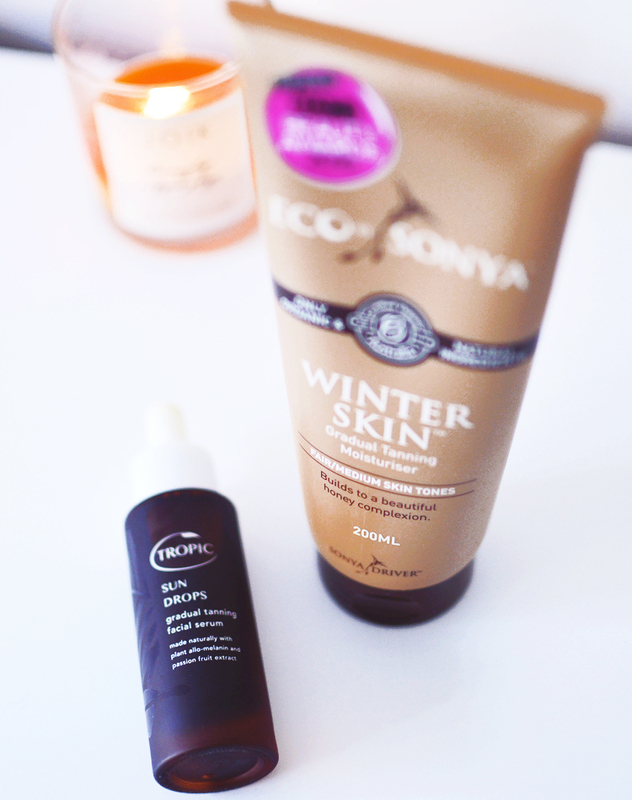 For lacklustre limbs, we have the Eco by Sonya Winter Skin Gradual Tanning Moisturiser. I've been using this on and off for ages now and the bottle is still going strong, so that's a huge win right off the bat. I originally bought this in September last year to apply it a couple of times before our holiday so that I wouldn't be so shockingly pale next to all the gloriously tanned Spanish folk and of course the crispy brown Britons who sunbathe from sunrise until sunset. You know the ones. Upon first use, I was pleasantly surprised to discover the moisturiser is, in fact, more of a thin lotion consistency that makes application quick and easy, no spreading a thick cream over the skin and massaging it in for half an hour only for it to gather at your ankles and turn them 5 shades darker. It sinks in quickly and you're free to get dressed and go about your day, or evening, without feeling sticky. The colour transformation is subtle and does take a good few days to build up to that 'beautiful honey complexion' mentioned on the bottle, but I like that! It's much less scary waking up in the morning to a subtle tan rather than a patchy orange disaster. At the moment I only use this once a week, during the 15 minutes or so every 168 hours that I get to myself to have a mini pamper routine; apply a face mask, moisturise, and maybe even brush my hair. Glorious. The boost in colour lasts a few days, even after showering, and like I said before, it's not necessary for winter really, but it makes me feel good, so screw it!